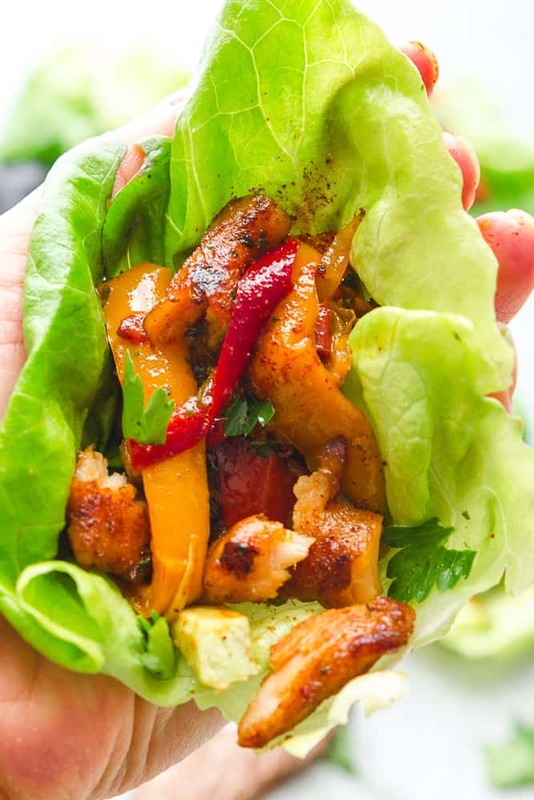 Chicken Fajita Lettuce Wraps – fresh, flavorful and a healthier way to enjoy fajitas! Less than 30 minutes to make and perfect for lunch or a lightened up dinner for busy weeknights! We have been on a huge lettuce wrap and fajita kick lately. 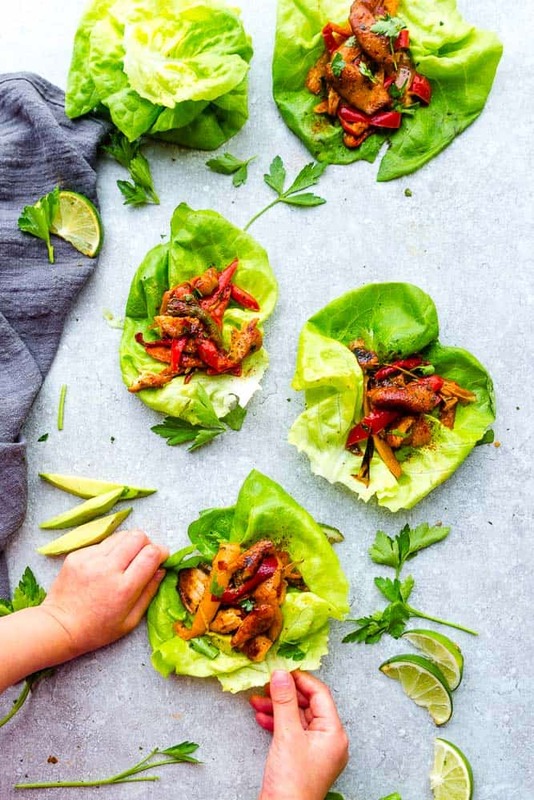 These Chicken Fajita Lettuce Wraps are a fun Mexican twist on this popular Chinese takeout item. They make a delicious and healthy lunch and are a great way to switch up your dinner routine. 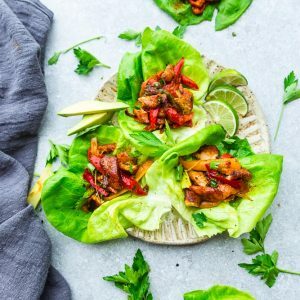 Chicken Fajita Lettuce Wraps are fresh, flavorful and super simple to make with a homemade Tex-Mex seasoning! And the best part of all? They come together in less than 30 minutes. Just perfect for busy weeknights. Lettuce wraps also make tasty appetizers at a party and are kid and adult approved. They’re also a great option if you’re looking for more Whole 30, paleo, low carb or ketogenic options. 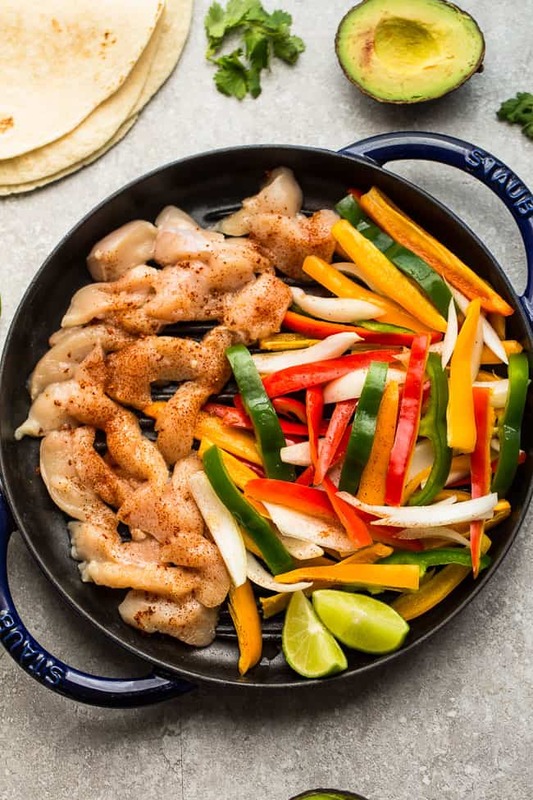 You’re going to start off by making the homemade fajita seasoning. It’s a blend of chili powder, cumin, smoked paprika, onion powder, garlic powder, salt and black pepper. Or if you already have a favorite brand of fajita seasoning, you can certainly use that instead. Toss the chicken with the fajita seasoning along with some lime and freshly chopped cilantro. Let the chicken marinate while you get your other ingredients ready. Slice up the onions and peppers and fry them up in your skillet. We used a mix of red, orange, yellow and red bell peppers – use any combination of peppers you like. Brown the chicken and divide into lettuce wraps. CAN I USE ANOTHER TYPE OF LETTUCE FOR THESE WRAPS? I love using butter lettuce but you can absolutely use your favorite green leaf lettuce that you prefer. Radicchio, steamed red cabbage or even collard greens would be delicious as well. WHAT ELSE CAN I SERVE WITH LETTUCE WRAPS? For a complete Mexican fiesta, you can serve these lettuce wraps along with some grilled corn, rice, beans and of course some guacamole or salsa. And if you’d rather enjoy a low carb meal in a bowl, layer the chicken fajita filling over some cauliflower rice or zoodles. 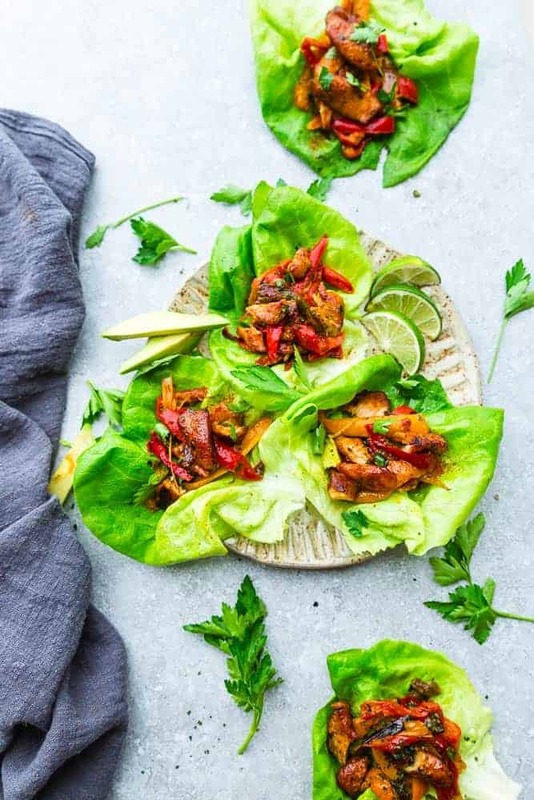 These Chicken Fajita Lettuce Wraps would make the perfect light lunch, dinner or even appetizers for your next spring or summer party. Grab an ice cold drink and enjoy them on the patio or deck for your next Mexican fiesta. In a resealable small jar, combine all the ingredients for the seasonings. Seal and shake well. Reserve 1 1/2 teaspoons for the vegetables. In a large resealable bag, combine 2 tablespoons of olive oil, lime juice and about 4 teaspoons of the fajita seasonings. Add the chicken to the bag and seal. Press the marinade into the chicken and allow to marinate while you prepare the vegetables (or chill in the refrigerator until ready to use). Heat 1 tablespoon olive oil in a large pan over medium-high heat. Add the onions and allow to cook for about 4-5 minutes, or until softened and fragrant. Add the bell peppers and sprinkle with the reserved 1 1/2 teaspoons of fajita seasonings. If you like the peppers with a nice crunch - cook for about 3-5 minutes. And if you like them softer, leave them on for about 3 minutes longer. Transfer and set aside on a plate. Melt remaining 1 tablespoon of oil on the same skillet and brown the chicken. Cook for 5-6 minutes, or until cooked through. Add the vegetables back to the pan until heated through. Remove from heat. Assemble lettuce wraps by placing a spoonful of chicken/vegetable filling into the center of each leaf. Top with avocado or your favorite toppings.